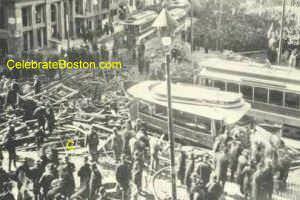 "On March 4, 1897, a huge gas explosion took place at the junction of Boylston and Tremont streets in Boston. The results were a demonstration of mingled public and private neglect. At the time of the disaster, the roof of the subway at the Boylston-Tremont corner had been completed. The surface level car-tracks at the junction of the two streets were supported on timbers covered with planking, while beneath was a considerable unfilled space, in which hung gas mains and sewer pipes, supported by the timbers above. For more than two months previous gas had been escaping from the mains, and a complaint was made to the Gas Company as far back as the 28th of the preceding December. The final explosion occurred at 11:46 in the morning on March 4, with the time being shown by clocks in nearby buildings stopped by the shock. At that time three cars were near the intersection of the streets: a Huntington Avenue car bound north, a Back Bay car going south, and a Mount Auburn car going east toward Washington Street. This latter car, when just over the track crossings, apparently ignited the mixture of air and gas with which the great cavity below was filled, and the explosion came with a burst of flames and a shock which broke the windows of every building for some distance about. The wrecked Mount Auburn car was at once enveloped in flames; the conductor of the Back Bay car, on the back platform, was instantly killed. The horses drawing this car were also killed, one of them being blown some distance. A cab, just then passing the corner, was wrecked. Bystanders saw the driver fall into the wreckage, which slipped into the gap made by the explosion. One of the two women passengers was killed outright, and the other was rescued, only to die next day of her injuries. The horse was blown free of the vehicle and killed. In all six persons were killed, and at least sixty were injured more or less seriously. The buildings all about were severely shaken, and their occupants were hurt by broken glass and in other ways. A dentist in the Hotel Pelham, on the southwest corner, was blown away from the patient on whom he was operating, and thrown across the room. The window of a jeweler's shop, in the same building, was broken out, and hundreds of dollars' worth of gems were scattered over the street. Laborious inquiries, official and otherwise, were followed by long-drawn suits in the courts, with the not uncommon failure to draw clearly the line of responsibility for the disaster. The bare, physical fact seemed to be that there was an old break in the six-inch gas main along the south side of Boylston Street, from which the gas might have accumulated in the space under the planking. The officials of the Gas Company had received complaints of escaping gas for weeks previous, and the calamity apparently might have been completely avoided. The property loss from this explosion was about $40,000, a quarter of this being on broken windows.